Importer/Retailer: Meijer Inc., of Grand Rapids, Mich. Hazard: Exposed and unshielded electrical components can cause the heater to overheat and melt, posing fire and electrical shock hazards. Incidents/Injuries: Meijer received one report of a unit’s base burning, melting and damaging the carpet beneath it. No injuries have been reported. 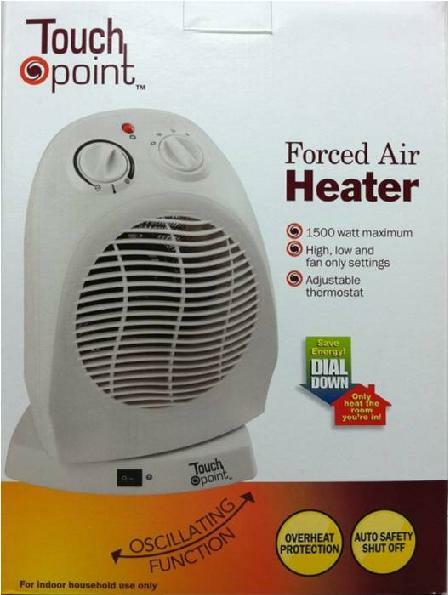 Description: This recall involves Touch Point brand oscillating forced air fan heaters with model number HW-218 and date code 0811. The model number and date code are on a silver sticker on the bottom of the heater. Universal Product Code (UPC) 7-13733-30927-1 is on the bottom of the packaging. The heaters are white, 12 inches tall, 9 inches wide and 8 inches deep. They have two round control knobs and a red warning light on the top front, and a black on/off switch on the front base that controls the fan’s oscillation. 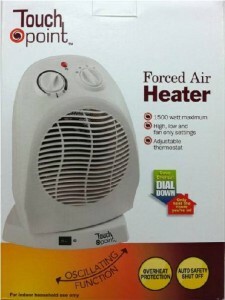 The words “Touch Point” appear on the right front of the heater’s base. Sold exclusively at: Meijer stores in Illinois, Indiana, Kentucky, Michigan and Ohio from September 2011 through November 2011 for about $20. Remedy: Consumers should immediately stop using the recalled heaters and return them to any Meijer store for a full refund.